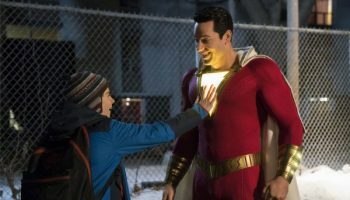 ‘Shazam!’ Movie Review – Spotlight Report "The Best Entertainment Website in Oz"
It’s taken a little while for the DC Extended Universe (DCEU) to catch on but it looks like they are finally realising that superhero movies don’t need to be so dark and serious. Last year’s Aquaman lead by the whooping, winking and smouldering Jason Momoa may have helped with the transition. But now a new contender for the ridiculous crown has entered, and with Shazam! the DCEU has been able to wholly embrace the goofy and self-aware. 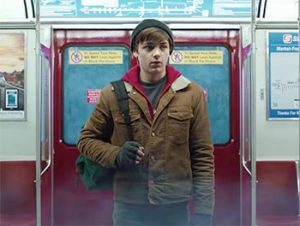 Billy Batson (Asher Angel) has been bouncing from foster home to foster home, unsettled and determined to find his birth mother. His latest group home sees him with five other fosters including Freddie Freeman (Jack Dylan Grazer). Billy has little intention of sticking around but when he ends up with superpowers after a run-in with The Wizard (Djimon Hounsou) he relies on Freddie to help navigate his new found powers. 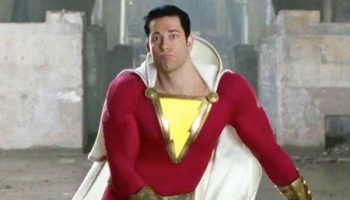 With a simple cry of “Shazam!” Billy switches from being an ordinary scrawny teenager, to being an extraordinary musclebound adult superhero (Zachary Levi). But being a hero in red spandex with a hooded cape without a set name isn’t all it’s cracked up to be. Directed by David F Sandberg (Lights Out, Annabelle: Creation) with a screenplay by Henry Gayden and story by Gayden and Darren Lemke, the origin story for this superhero takes much of its structure and characters from Geoff Johns and Gary Frank’s 2011 comics run. It also surprisingly begins with us meeting young Thaddeus Sivana (Ethan Pugiotto) bullied by his brother and overbearing father, who after meeting The Wizard fails the test of honour and purity. Years later we then meet Billy, skipping out on foster homes, not because the people he’s with are bad, but he’s determined to find answers as to why his mother abandoned him. Thematically the film’s emotional crux is all about family, whether it’s the ones we are born into who can be terrible, or the ones we form out of choice. This is where the film has its heart, and tonally feels very akin to 80’s films like The Goonies or Stand By Me or E.T. 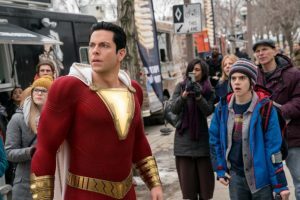 The trailer gives away some of the antics that Shazam! Billy and Freddie get up to in testing out his powers. Obviously there are a few more which we won’t spoil, but that whole sequence is definitely one of the funniest in the film. 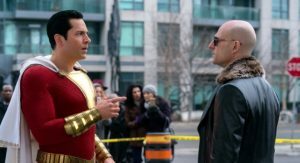 It embraces a level of self-awareness and satire that’s not quite Deadpool levels but has certainly distanced itself from the DCEU’s dark, broody and serious reboots that have come before. In some ways this is the ultimate nerdy kid representation of a nerdy kid fantasy. It probably leans a little more on the humorous than dramatic side but it does feel fairly well balanced. The tag team pairing of the teenagers Angel) and Grazer is excellent, Angel) plays the guarded and reserved runaway against Grazer’s hyper-talkative pop culture nerd with a crutch (his disability is never explained, it just is). As the film progresses their friendship goes through some expected turmoil that must be overcome in order to feel it’s earned. But despite the trope-y nature of it, these two never make it seem disingenuous. However it’s when Zachary Levi shows up that it becomes almost impossible to have your attention anywhere else. The obvious Tom Hanks in Big correlation can be made, he’s playing a teenager in a very oversize superpowered body and he doesn’t quite know what to do with it, so the amount of joyous fun Levi is having onscreen is infectious. Mark Strong plays the corrupted and villainous adult Dr Thaddeus Sivan, his motivation for power is a little thin and never properly explained but a couple of unsettling moments with his ghoulish smoke-like monster friends means he’s all business.The film also has some solid supporting cast, Faithe Herman as Darla Dudley, one of the young foster kids and “sister” to Freddie and Billy. In fact all the siblings are actually great and thankfully none of them overstay their welcome. Cooper Andrews and Marta Milans as Victor and Rosa Vasquez, the foster parents for Billy and Freddie are also adorable in that homely “wish they were your parents” kind of vibe too. With the film being set in Philadelphia, not the most recognisable of American cities, cinematographer Maxime Alexandre keeps the majority of the visual focus tightly on our characters rather than the scenery. It’s only when we visit the lair of The Wizard that we get treated to some trippy multiple levels of a dank cave with magic doors. The final climactic battle at the fairground is also great as it switches from mid-air battles to skirmishes amongst the carnival attractions. Shazam! is a good natured, funny and inspiring film that shows that even the hero can make it with a little help from their friends and family. 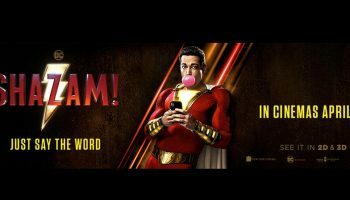 Shazam the character may not have the same notoriety as some of his DC stablemates but surely after this film he’s going to become a lot more popular. Also be sure to stick around for a mid and end credit scene, the former is setting up potential future movies, the latter an obvious in-joke DCEU gag. 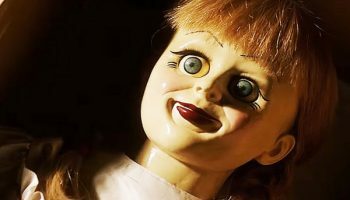 ‘Annabelle: Creation’ Debuts Official Trailer!